Here we're going to document the HS5461AS 4 x 7-Segment display. 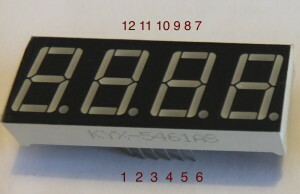 It is a 5.4" 7-segment display ("54"). "61" indicates the display type - there are many different types, like 41/42, 51/52, 55/56, 61/62, etc - google for more. "B" is common anode ("A" is common cathode). "S" I think is with the dots. "H" is with two dots, for hourly display. There are a lot of pins involved here, 12 in total. // In the table above see how these refer to digits. // How many times has this display-loop been called? // This is why we have the loop index.